The model 4002 was introduced in 1977. The features of this instrument was very exclusive. 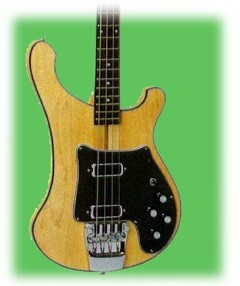 Body made of Byrdseye and Curly Maple finished in Mapleglo or Walnut. Deluxe block binding. Laminated custom pickguard. Laminated fully bound Maple neck and head. Imported Ebony fingerboard with pearl style inlays. 21 frets on a 33 1/2 inch scale. Two super high gain humbucking pickups. Individual tone and volume controls for each pickup. Separate Rick-O-Sound stereo and mono output jack. Special low impedance output jack for direct connection with recording studio control board. 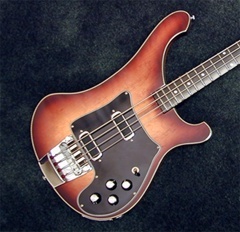 Contrary to what many people think this bass was never intended as a limited edition, nor did the company ever describe it as such at any time. In fact, the concept of limited edition didn't even exist then. It came into the line and then was discontinued, as have been any number of models and options throughout the years. Courtesy of John Hall RIC.